Update 12/23/2018: Three new cars ready to go. Also a big thanks to Don Gehrig for the master to the TR6 in order to add to our lineup. Please note we had to discontinue several cars for various reasons. Update 10/15/2017: We are almost ready for the Fall/Winter new cars. See them Here . I will be attending the Richfield Ohio show Oct 29 2017. The Firebirds, Torino and the Truck will be there. Update 12/22/2016: We didn't quite make 2016 for the new cars but they are almost ready. Here is a quick peek. We will be at Bob Beers show in Feb and should have at least four of them done. Cars on the list this year include a 51 Chevy, 64 Mercury, 59 Lark, 71 Firebird, 70&72 Torino plus several GT cars. Update 11/30/2014: I wont quite make Christmas but I will have at least 4 of these 6 ready for Bobs Super Bowl Sunday show on Feb 2015. See them here. Update 1/12/2014: We are very close now with the next four cars. See pictures here and here. I will be at Bob Beers Super Bowl Sunday show Feb 2nd. We will have those four cars ready to go there. Will release on the website in the following weeks. Update 4/7/2013: The next batch of cars are about a month away. We will be at the Richfield OH show this April with several of these available. Take a look at the prototype pictures here. Update 2/14/2010: How about 4 new cars and 3 prototypes here! Unfortunately the chassis prices have climbed to $10 due to availability. Also the American street kits have been suspended. If all goes well .. I'll have a good selection of the above cars at Richfield on Oct 28th. Update 9/3/2007: Gearing up for the fall season. Lets start by listing some long awaited prototypes here. We should have at least 5 of these ready to go in early Oct. Unfortunately the kit options will end in Oct when I list the next group of new cars. We plan on being in Richfield OH for Brads show in late Oct.
Update 1/28/2007: We have been busy but the time has come .. new models ready to go. 'The Latest' has all the new offerings. The kit option is available for the new models and will continue at least into the spring. We'll be at the Super Bowl Sunday show in NY as well. NEW!! -- limited time offer of American street cars in kit form. Also have pictures of some of the upcoming cars here. Update 07/24/2005: A long needed prototype update is here. Cars will start rolling out in August. I want to thank all who have sent their best wishes as I recovered from my recent illness/surgery. I'm back and feeling great and virtually all caught up with past orders. Update 02/10/2005: This is just a price/inventory update. Please note after 7 years of having the NOS tjet chassis price at $6 .. I finally need to raise it to $8. All other prices remain the same. 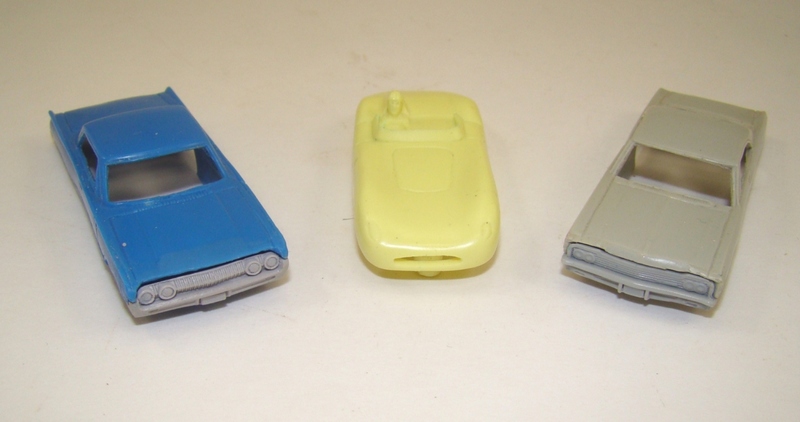 I also have discontinued the '68 mevCyclone and '68 mevMustFstbk. Only the decals for these cars are available in regards to the stock cars and drag cars associated with these bodies. Please come back soon .. we will have the more exciting prototype update! Update 09/27/2004: One more original body and one more stock car listed under the latest -plus- WE NEED YOUR HELP. I'm trying to model all 59 cars that ran in the 1959 Daytona 500 and do not have all the info to do it. I'm paying/crediting any individuals that can help! Please go to www.1959daytona500.com for details. Update 09/19/2004: We have 5 new cars for this update listed under the 'Latest' link to the left. Come next week and we'll roll out even more. We'll be at Richfield OH (Oct 24th) and the Chicago show (Nov 14th). Also .. please note that we can be reached at www.mevoriginals.com as well. Update 06/20/2004: The Previews are ready! Looking like 6-8 weeks and they will all be ready! Click here to see them. Update 05/02/2004: How about another four new cars. Still working on those prototype shots. For you Pickup fans and Racer fans .. there is something also coming very soon! Update 03/18/2004: Added 9 more Vintage stock cars. Enjoy! Prototype shots are coming soon of more new cars. Don't forget .. we'll be in Chicago at the Matteson Holiday Inn this weekend (3/20-3/21).. see you there. Improved Stock Cars .. now with major and minor sponsors! What's happening for 2004 you may ask. Big things are planned. We will do a ten year (one each year) Mopar group which will include the following cars: '59 Desoto; '60 Plymouth; '61 Valiant; '62,'63,'64 Plymouth; '65 Coronet; '66 Charger; '67 Cuda top-up-conv; '68 Coronet, They will rollout all year in no specific order. Also look for a '58 Ford; '57 Bel-air; '57 Olds; '61 Pontiac. We'll be in Chicago for the Mar 21st Dolton show and NY for the April 4th Long Island show as well as Richfield at the end of April. Update 10/31/2003: More Prototypes .. here. Look for us at the Chicago (Dolton) show on Nov 9th. Update 08/05/2003: mevFordMirage makes its appearance! Will be adding Drag cars, decals and tons of new thumbnail pictures to the site very soon. The '61 mevCorvair is only weeks away ..
Update 06/15/2003: Ready with the '65 mevImpala! More to come very soon. Also .. If anyone was having a problem paying by Paypal from this site due to having high security settings turned on .. that problem has been fixed. Update 05/07/2003: Just recovering from a busy show season and now got a chance to update the site. The '60 mevStarliner is already along with a new drag car .. a '68 Cobra Jet. The '65 Impala is ready but we don't have decent amount of stock built up so I'll be releasing that car in about 2-1/2 weeks. Although, I do have more prototypes shots here of the cars coming very soon. We'll be back shortly with another update! We're hoping to start rolling these out early next year. Update 10/11/2002: We have the final 3 of the 7 prototype cars ready ('62 mevBel-air Wagon, '61 mevGMC truck and the '57 mevFord) however we won't be able to offer them on the website at this time. Due to significant volume we won't be able to produce enough of them to satisfy demand at the moment. We will have 8 or so of each at the NY, Ohio, and Chicago shows for sale. Look for them around Nov 11th on the website. Update 9/17/2002: We keep rolling .. 2 new American classics (an mevBonneville and an mevElcamino .. both '60) and 2 new stock cars. Update 8/30/2002: We are ready with D-Type Jag (Racer series) and an orphan car .. '53 mevPackard. Others will follow every 2 weeks. Also .. for you Netscape 4.0 users .. we've retro-fitted the site to work with that browser. Update 7/7/2002: 7 of the 10 cars are just about ready for release. Check here for prototype shots. These cars start rolling out late August and all will be ready for the fall show lineup! Update 12/30/2001: The mevFord-MKIV is finished! This car has side open windows for ease of oiling and a little more side chassis clearance than the other models. Cool silver stripe on this model if ordered assembled. I also have some more sneak peeks of more cars to come right here. See you at Bob Beers show on December 23rd. Update 11/1/2001: The '60 mevBiscayne is ready to go! We'll have 2 new racer's out very shortly .. check here for sneak peeks. We'll also be introducing 7 new colors to our line up that will represent the early 60's/late '50s cars closer to original 1:1 production colors. Update 6/24/2001: The 58 mevFury is ready! Check the 'latest' section for pictures. We also have the rear tuff one's '60s stock rims in chrome now in production. And how about a sneak peek at the anticipated Mini Cooper. Update 5/20/2001: We're ready with the first two racers! They will be the mevFerr330p4 and Rally mevCorvair. Expect more 'Racer' releases about every 2 months. Also, the 59 mevElectra Wagon is in production. Update 12/11/2000: New pictures of the 63 mevNova Wagon. The mevHurstOlds-68 is now only available in factory Silver w/black. You will also find a NEW worksheet/shopping list page that will keep track of all items you would like to purchase. Come back soon for my next custom cars .. 64 mevRamcharger and 64 mevPolara stock cars! BONUS .. All car purchases starting 01/01/2001 will include the special packaging/labeling for free! I also have a '63 mevNova wagon as a 'bonus car'. Although this won't be ready until late Oct. A vast collection of stock cars is now available! Fourteen in all (please see 'stock cars' below 'the latest' on the contents frame). I will be at the NJ show on Sept 24th where I will debut all the cars and will start taking orders for those cars starting then as well. I will also be in NY at Bob Beer's show on Oct 1st. See ya there! Update: 6/29/2000: Sneak peek pictures of the new cars. These cars will debut at Bob Beers Superbowl Sunday Show. They will be ready for order the second week of Feb. I have taken new photos of all my currently available customs, too. Enjoy! Update: 10/12/99: The '59 mevRanchro is now ready. I'll be at Brad Bennet's show this weekend (Oct 17)! I'll have some mevDart GTS's and some Yenko mevCorvairs on display along with a good supply of all my stock. Look for new photos of the cars later this fall since I'm getting a new camera. Update: 9/20/99: The '62 mevWildcat and '69 mevDart are ready to go. The '59 mevRanchero will be ready in a week. See you all this fall at the shows! Old and new addresses are being used for April. I'll be at Bob Beers Super show on April 11th and Ohio (Richfield) on April 18th. Update 3/14/99: The '66 mevCorvair and '58 mevCaddy are finished and will debut March 21st at Dolton. Photos are also available under 'latest'. I have a bonus car also ready to go .. a '59 mevEl-Camino! Update 1/15/99: The '71 chev truck is finished and pictured. I also added the missing photos from the tjet shrine (flamethrowers, sandvan, snowmobile). The '66 mevCorvair and '58 mevCaddy will be added in Feb. The cars will debut at Dolton (Chicago) show on March 21st. Incredible new Resin .. yields more vibrant colors,extreme durability and mirror finishes. New cars listed: '59 mevElectra, '59 mevImpala, '58 mevEdsel, and '71 mevMonte.